Onam is the largest festival in the Indian state of Kerala. It falls during the first month of the Malayalam calendar which is Chingam (August–September) and marks the homecoming of the legendary King Maveli. The festival lasts for ten days and is linked to many elements of Kerala’s culture and tradition. Intricate flower carpets, elaborate banquet lunch, snake boat races, Puli Kali, and the Kaikottikkali dance all play a part in the festival. And it can be undoubtedly said that these elements constitute the diversity, colorfulness and richness that no other festival can claim in this world. Onam is an ancient festival which still survives in the Modern times. Kerala’s rice harvest festival and the festival of rain flowers which fell on the Malayalam month of Chingam celebrated the annual visit from pathalam of the very noble Demon King Maveli. Onam is unique since king Maveli is revered by people of Kerala from prehistory. According to the legend, Kerala witnessed its golden era during the reign of King Mahabali. Everybody in the state was happy and prosperous and the king was highly regarded by his subjects. He was that much highly regarded among the subjects that even the Gods under Indra became jealous of Mahabali, they approached Mahavishnu claiming that Mahabali is now equivalent to an Indra. Since a world with two Indras represents imbalance, Mahavishnu assumed the form of a dwarf: the Vamana avatara had tricked him to Pathalam, the Underworld. However, as Mahabali is equal to an Indra, he is to wait until the next Yuga where he would be the Indra. In the meantime, with the grace of Mahavishnu, Mahabali visits his people on an annual basis. Mahavishnu serves Mahabali as a gatekeeper in the world of Pathalam as the Lord himself serves his greatest devotees. It is this visit of Mahabali that is celebrated as Onam every year. People including children celebrate the festival in a grand way and impress upon their dear King that they are happy and wish him well. The rich cultural heritage of Kerala comes out in its best form and spirit during the ten day long festival. The most impressive part of Onam celebration is the grand feast called Onasadya, prepared on Thiruonam. It is a nine course meal consisting of 11 to 13 essential dishes. Onasadya is served on banana leaves and people sit on a mat laid on the floor to have the meal. 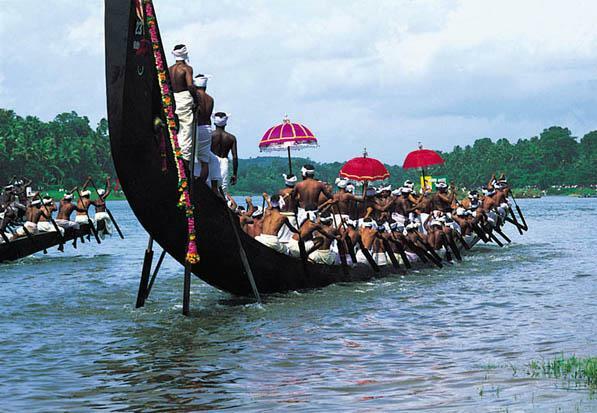 Another enchanting feature of Onam is Vallamkali, the Snake Boat Race, held on the river Pampa. It is a colourful sight to watch the decorated boat oared by hundreds of boatmen amidst chanting of songs and cheering by spectators and viewers. There is also a tradition to play games, collectively called Onakalikal, on Onam. Men go in for rigorous sports like Talappanthukali (played with a ball), Ambeyyal (Archery), Kutukutu and combats called Kayyankali and Attakalam. Women indulge in cultural activities. They make intricately designed flower mats called, Pookalam in the front courtyard of the house to welcome King Mahabali. Kaikotti kali and Thumbi Thullal are two graceful dances performed by women on Onam. Folk performances like Kummatti kali and Pulikali add to the zest of celebrations.Mahabali’s rule is considered the golden era of Kerala. Mahabali was the grandson of Prahlad (son of Hiranyakashyap who was slain by Vishnu in his Narasimha Avataram). Prahlad, despite being an Asura, had great faith in Vishnu. Mahabali learned the act of love and devotion to Lord Vishnu as a child, from Prahlad. Kashyapa had two wives, Diti and Aditi, who were the parents of the demons and the gods (Asuras and Devas) respectively. Kashyapa, who had gone to the Himalayas to do penance, on his return found Aditi weeping. By divine insight, Kashyapa instantly recognised the cause of her grief. He tried to console her saying that nothing happens in the world without divine will and people should go on doing their duties. He asked her to pray to Vishnu and taught her Payovrata, a ritual that has to be observed from the 12th day of the bright half of Karthika (Sukla-paksha Dvadasi). Since Aditi carried out the Vrata with a pious heart, Vishnu appeared before her and informed her that he would help Indra. Alternatively, the Devas were very annoyed as Mahabali became the ruler of all the three worlds having defeated the Devas. Devas, the celestial beings, were annoyed and jealous. The gods approached Vishnu and asked for his help. Vishnu said to the Devas that Mahabali is doing good things to his subjects and is eligible to become sura (devas). You devas should not be jealous about that. Being jealous would make you asuras. Vishnu decided to test Mahabali. In the meantime, Mahabali was performing the sacrificial rite of the Viswajith Yagam or Aswamedha Yagam on the banks of Narmada River. He also declared that he would give anything that anyone sought from him during this Yagam. Taking advantage of the Yagam and Mahabali’s declaration, Vamana (Mahavishnu disguised as a Brahmin) came to the Yaga-shala. As he approached them, the sages assembled there perceived the extraordinary effulgence form of the young lad. Mahabali went forth to receive the Brahmin boy with all traditional honours and gave him an eminent seat befitting the status of a holy person. With the usual courtesy given to the people who come to ask for help, Mahabali told him that it was his good fortune that Vamana had chosen to honour him with his presence. Whatever Vamana desired, Mahabali was ready to fulfill. Vamana smiled and said: “You need not give me anything great. It is enough if you give me that extend of land covered by three footsteps of mine”. On hearing him, Mahabali’s preceptor, the Brahmin Shukracharya (a Daitya priest), who had visions of the future, told Mahabali that the one who had come to take alms from him was not an ordinary Brahmin but Lord Vishnu Himself having assumed this form. He advised Mahabali not to promise the lad anything. But Mahabali was a king who would never go back on his word, considering it sinful to do so. Shukracharya insisted that he should not fulfill the demand of Vamana as he had come to deprive him of all his possessions. Onappottan, in traditional costume is a custom in northern parts of Kerala. Onappottan visists houses during the onam and gives blessings. Off late onappottan has become a rare sight, confined to villages. Mahabali, determined to honour the word given to Vamana, begged the pardon of his Guru for disregarding his advice. Earlier, while Mahabali was embarking on the war with Indra, he had prostrated at the feet of his preceptor, Shukracharya, and on his advice had he started the Vishwajith Yagam from which he secured some very powerful weapons. It was only because of Shukracharya’s help that he was able to conquer Indra. Mahabali’s refusal angered Shukracharya. He cursed Mahabali, saying: ‘As you have not heeded your Guru’s words, you will be reduced to ashes’. Mahabali was firm and replied: ‘I am prepared to face any consequence but will not go back on my word’. Saying so, he asked Vamana to measure the desired three feet of land. All attempts of Shukracharya to dissuade Mahabali proved futile. Mahabali considered everyone who came to him for help as god himself and never refused them anything. Mahabali told his Guru: “Prana (life) and Maana (honour) are like the two eyes of a person. Even if life goes, honour should be protected. Knowing that the person that has come now is the Lord Himself, I should be the most fortunate one as the Lord, who gives everything to mankind, is seeking something from me.” Mahabali gladly said that even if Vishnu himself were to come to his sacrifice and ask for anything, he would deliver it. 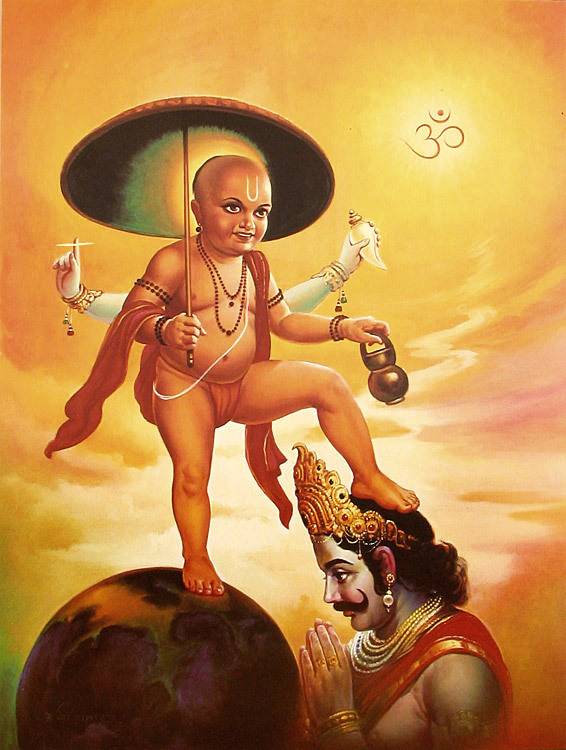 Vamana grew in size until he towered above the heavens. With one footstep, he measured all of the earth. With the second, he claimed all of heaven. There was still one foot of territory that Mahabali owed him. Mahabali requested Vamana to place the final step on his head as the third step of land, for he had no other left. Vamana did so and in doing so, pushed him down to Patala, the underworld (the kingdom beneath the earth). The site where he placed his foot is said to be the village of Thrikkakara (meaning place of the holy foot), and is the centre of the renowned Onam festival celebrated in relation to the legend of King Mahabali. For the devotion of this daitya, Mahabali, Lord Vishnu (Vamana) granted him rule over the underworld. It was also granted that he would hold the position of Indra for one Manvantara, thus fulfilling his devotee’s desire (the office of Indra being a rotating position, changing every Manvantara). As a last gift, Mahabali was granted permission to visit his subjects once a year. Thus, Keralites celebrate the Onam festival to commemorate the memory of the Great King Mahabali who would keep his promise to visit. Mahabali fulfilled his name as the great martyr for the sake of Truth (“Satya”). The name “Mahabali” itself means Great Sacrifice. During Onam, the feast and festive mood of the people, dressed in their best, is considered reminiscent of the prosperous and truthful life of the subjects during Mahabali’s flawless reign. People wear new clothes (Vastra) during Onam. The ‘Vastra’ also stands for heart. Thus the significance of wearing new clothes is about making the heart new by removing all bad thoughts and feelings. People forgetting their sectarian outlooks, join together to welcome the auspicious ‘Thiruvonam’ day. It would seem unfair that Lord Vishnu punished Mahabali, who like his grandfather (Prahlada), was deemed one of the greatest devotees of Lord Vishnu, and a very just king. However, Mahabali is not considered penalized by Vishnu, since he was granted the blessings of Vishnu and his remembrance allowed to be observed for eternity by way of Onam. He was also given the opportunity to keep his head under Lord Vishnu’s holy feet, thus allowing all his sins to be wiped away. Also, by the grant of Vishnu, Mahabali will be the next (eighth) Indra during the time of the eighth Manu, Savarni Manu. Purandara is the current Indra. It is believed that Mahabali became the greatest earthly devotee of Vishnu by sacrificing his kingdom to him. 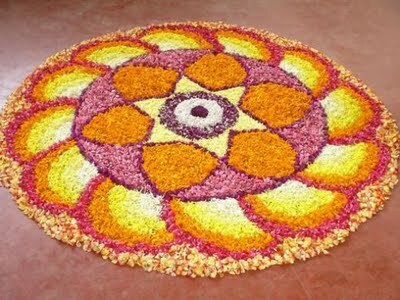 The celebrations of Onam start on Atham day, 10 days before Thiruvonam. The 10 days are part of the traditional Onam celebrations and each day has its own importance in various rituals and traditions. 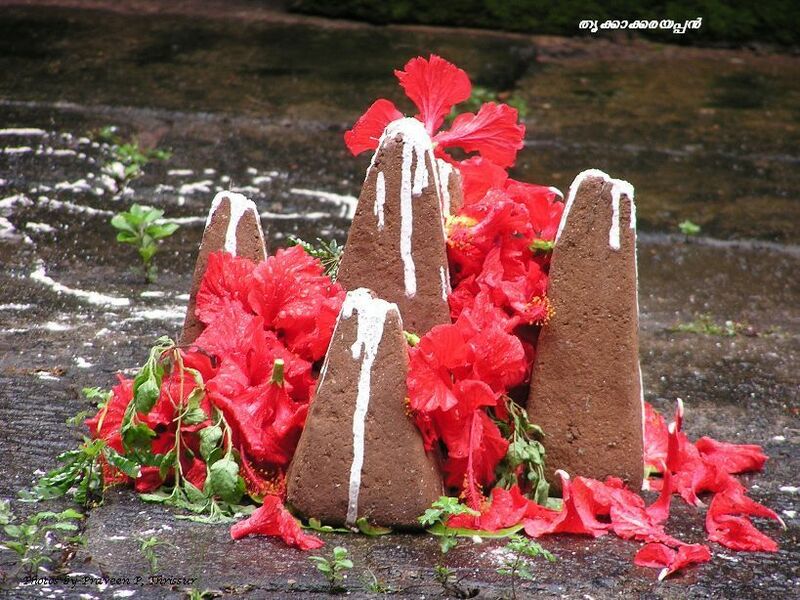 Earthen mounds, which look somewhat like square pyramids, representing Mahabali and Vamana (an Avatar of Vishnu) are placed in the dung-plastered courtyards in front of the house and beautifully decorated with flowers. Known as ‘Onapookkalam’, it is a carpet made out of the gathered blossoms with one or two varieties of foliage of differing tints pinched up into little pieces to serve the decorator’s purpose. It is a beautiful work of art accomplished with a delicate touch and a highly artistic sense of tone and blending. (In a similar manner North Indians make something called “Rangoli” which is made of powders of various colors.) When completed, a miniature pandal, hung with little festoons is erected over it. Onam starts with Atham day in the Malayalam month of Chingam. Its believed that King Mahabali start his preparations to descend from heaven to Kerala on this day. The day also marks the start of festivities at Thrikkakara Temple (considered as abode of Mahabali). The Onam celebrations across the state, starts off with a grand procession at Thrippunithura near Kochi called Athachamayam. In olden days, the Kochi Maharaja used to head a grand military procession in full ceremonial robes from his palace to the Thrikkakara Temple. After independence, the public took over the function and celebrated as a major cultural procession which kicks off the official celebrations of Onam. Elephant processions, folk art presentations, music and dancing make Athachamyam a spectacular event which is now aggressively promoted as a tourist event. 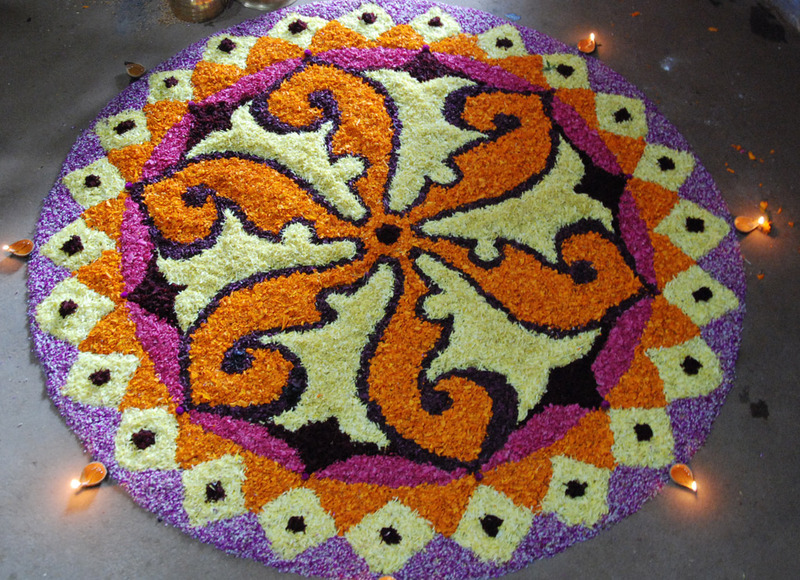 The traditional ritual of laying Pookalam (floral carpet) starts on Atham day. The size of pookalam on this day is called as Athapoo and will small which eventually grew day after day. Only yellow flowers will be used on this day and the design will be simple. Also the statues of Mahabali and Vamanan will be installed on the entrance of each house on this day. The second day is marked off when a second layer is added to pookalam design with 2 different colours apart from yellow (mostly orange and creamy yellow). On this day, people starts cleaning the house-hold to prepare for the Thiruvonam day. The pookalam now will start growing in its size by adding new layers or designs with at least 4 to 5 different flowers. The day also marks the start of shopping activities. Onam is associated with gifting new clothes, hence from this day onwards people start buy new clothes and jewellery. Vishakam is considered to be one of the most auspicious days of Onam. In olden days, the markets open this harvest sale on this day, making one of the busiest days in the markets for public. Today Vishakam marks the start of many Onam-related competitions like Pookalam competitions etc. Anizham is one of the most important day in the Onam days as it kicks off the great Vallam Kali (Snake boat) at many parts of Kerala. A mock Vallam Kali is conducted on this day at Aranmula as a dress-rehearsal for the famed Aranmula boat race which will be held after Onam. By the sixth day, the public frenzy starts going on higher side. Most of the schools and public offices starts issuing holidays from this day onwards and people starts packing their bags to their native homes to celebrate the festival with their dear ones. The pookalam design will be very large by this time, with at least 5 to 6 new flowers types added to the original designs. On the seventh day, the smaller versions of traditional Ona Sadya (Onam special buffet lunch) starts in many places. Most of the temples offers special sadhyas on from this day. Festivities include Puli Kali (Masked leopard dance) and traditional dance forms like Kaikotti Kali also performed in various functions. The official Government celebrations starts on this day with heavy illuminations in Thiruvananthapuram City, Kochi city and Kozhikode along with fireworks. The day marks off with a major traditional ritual where the small statues of Mahabali and Vamana will be washed and cleaned and taken around the house as a procession. It will be later installed in the center of the pookalam smeared with rice-flour batter. The smearing is done by small children whom will be Pooradaunnikkal. From this day onwards, the statue will be called Onathappan. The pookalam design from Pooradam day onwards get much bigger and complex in design. Shopping will be one of the major activities as the public will be making final purchases for the great Thiruvonam day. 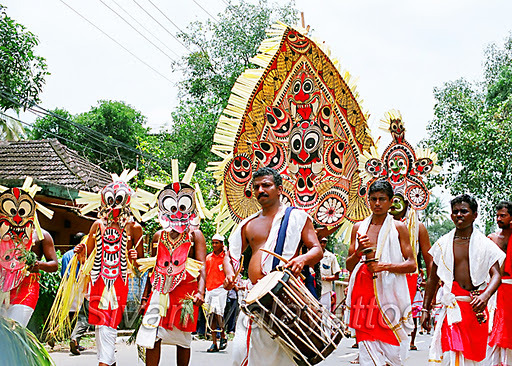 Uthradom is the ninth and the penultimate day of the festival of Onam. It is considered as Onam eve and celebrated in a very big way. The importance of this day is last minute extreme shopping frenzy called as Uthradapachal and is considered the most auspicious day for purchase of fresh vegetables and fruits along with other provisions from the Thiruvonam day. Uthradam is known as FIRST ONAM because it marks the day when King Mahabali descends Kerala and the traditional myths says that the king will spend the next four days touring his erstwhile kingdom and blessing the subjects. Due to this Urthadom is celebrated in a very pompous manner with larger pookalam and celebrations in household. The Urthada lunch is very famous tradition. Women normally cuts the first set of vegetables on this day that marks the celebrations of Thiruvonam in each household and preparations for grand Onam buffet starts in evening of Uthradom day. The final day of Onam that culminates the 10 days of Onam Carnival. The day is known as Thiru-Onam (Sacred Onam Day) also known as SECOND ONAM. Myth says, it was the day Mahabali was suppressed to underworld by Vamana. The day marks return of Mahabali to his fabled land (Kerala), as per the boon he received from Vamana to meet his subjects and bless them. Apart from this myth, this day is considered auspicious being birthdays of several temple deities like Vamana of Thrikkara temple, Sree Ppadmanabha Swamy of Thiruvananthapuram etc. Though a traditional Hindu festival, Onam today has emerged as a secular festival associated with harvest time of Kerala. Activities begin early in the morning. People clean their house, smear the main entrance with rice-flour batter (a traditional welcome sign), take early bath, wear new clothes and distribute alms to needy. The eldest female member of each family presents clothes to all the members of the family. Special prayers and Masses are organized in temples, churches and mosques that highlight the secular nature of festival. Later a very special and the biggest of all days, Pookalam is prepared to welcome Mahabali. The most important activity of Thiruvonam is the grand Thiruona-Sadya, well known for being one of the most sumptuous feasts ever prepared by mankind. The level of sumptuous varies at each individual household, however every household tries to make as grand as possible as they can. The feast served on plantain leaves have more than 13 to 15 curries apart from other regular items. In hotels and temples, number of curries and dishes can go up to 30 for the feast. Whatever may happen no malayalee will miss the Grand ona-sadya. There is a saying in Malayalam that “Kanam Vittum Onam Unnanam” which means “We should have the Thiruvonam lunch even if we have to sell all our properties” which shows the importance of the grand lunch on the Thiruvonam day. A fabulous display of fireworks turns the capital Thiruvananthapuram and Kochi into a veritable fairyland. Sumptuous feasts are prepared in every household. Even the poorest of the poor manage to find something for himself to celebrate the national festival in his own humble way. The afternoon is marked with various traditional Onam games normally seen common in rural areas and those organized by resident associations, clubs etc. in large cities. Normally Onam celebrations ends by Thiruvonam. However two following days after Thiruvonam is also celebrated as Third and Fourth Onam. The third Onam is called as Avvittom which marks the preparations of King Mahabali for his ascension to heavens. The main ritual for the day is to take the Onattappan statute placed in middle of Pookalam for past 10 days and immense in nearby rivers or seas. The pookalam will cleaned and removed and marks the finale to the Onam celebrations. The day is also important, as it marks the great dance of lions, known as Puli Kali where men in costumes of lions, dances and make a procession around the town of Thrissur in large groups. The Puli-kali can marks the end of traditional Onam celebrations. Fourth Onam is called as Chatayam which marks the birthday of one of the famous social reformer of Kerala, Sree Narayana Guru and celebrated as Narayana Jayanthi in his honour. The official government celebrations ends on this day with a mega dance festival in the capital city- Thiruvananthapuram. The most important things about Onam are the onakkodi, the new clothes worn on this day and onam sadya, a feast which is quite elaborate. This is usually a feast served on banana leaves and serves rice along with at least an array of 4 dishes. Traditional pickles and papadam are also served. Dessert is usually ‘payasam’, a sweet dish made of milk, sugar and other traditional Indian savories. 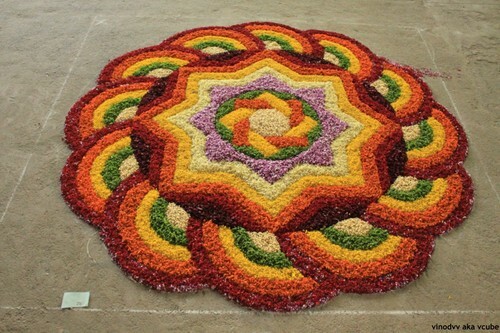 During Onam, people create a multi-coloured floral decoration on the ground in the front of their home called pookkalam. Young children especially girls are often entrusted with the task of gathering and laying out the flowers in elaborate patterns. 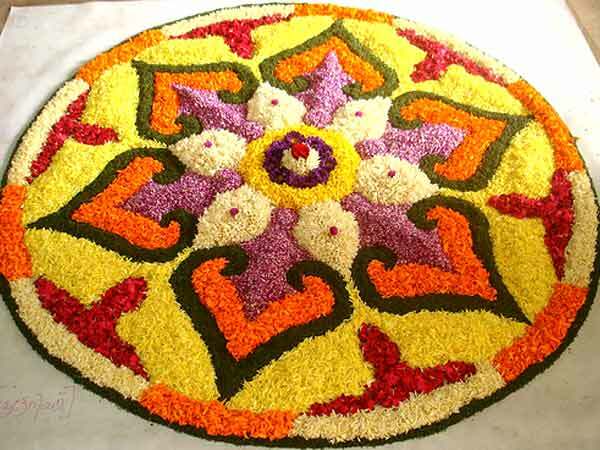 Competitions are held on onam day to create this floral design. It is usually 1.5 m in Diameter usually in circular shape. A lamp is usually placed as part of the design. In the recent years, the floral designs have evolved from the traditional circular shape to unique designs depicting different cultural and social aspects of Kerala life. The Vallamkali (the snake boat race) is another event that is synonymous with Onam. Well-known races include the Aranmula Boat Race and the Nehru Trophy Boat Race. About 100 oarsmen row huge and graceful snake boats and men and women come from far and near to watch the snake boats skim through the water. During the Onam, Keralite Hindus install an image of Thrikkakara Appan (Vishnu in the form of Vamana) in their home just as Hindus install images or murtis of Lord Ganesh on the Ganesh Chaturthi festival. This festival is also important because of its popularity with all communities within Kerala. Although the festival of Onam originated with, and is connected to the Hindu religion, it is celebrated today with equal fervour by the Hindus, Muslims and Christians of Kerala.